This is one of those bizarre things that comes into my head that I think 'I can make that work if I just do xyz'. Well.. kind of. It's one of those meals that tasted rather nice but didn't quite look as good as it could and didn't quite turn out the way I'd planned it. They were slightly sloppier than I'd intended. No problems with the flavour, just a bit messier to prepare. Preheat oven to gas mark nine. Clean the outside of your pumpkin, removing any stickers. Pierce the flesh in a few places to prevent it exploding while roasting. Place in a roasting tin and roast for forty-five minutes, until the skin is dark brown (but not burnt). The flesh should have shrunk away from the skin, making it far easier to peel. Peel the pumpkin, remove the seeds and stringy centre and place the flesh into a large mixing bowl. Purée with a hand blender - draining excess liquid where possible. Add all of the remaining ingredients except for the flour and combine. Cover a surface (dinner plate/chopping board/side) with plain flour. 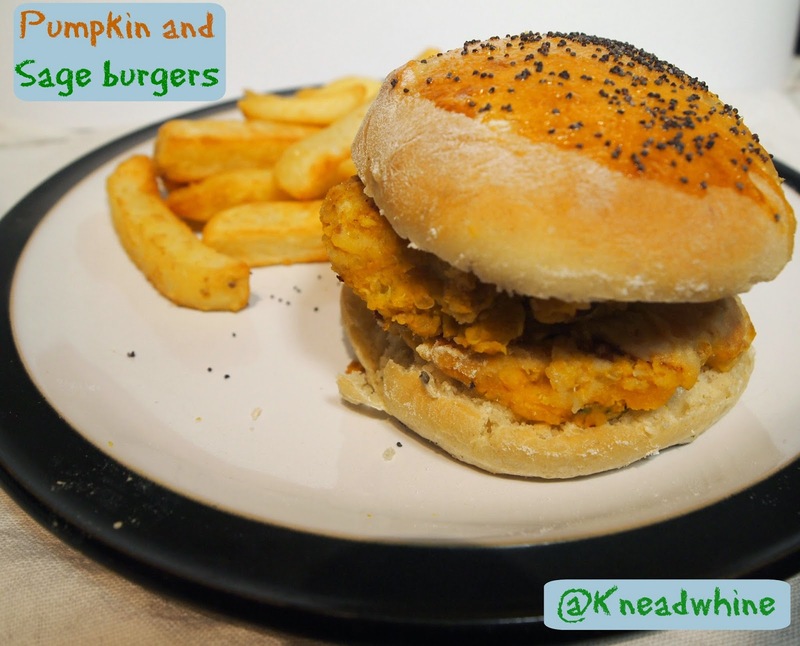 Form the pumpkin mixture into ten patties - you may need to squeeze out a little excess moisture. Coat both sides with flour. Heat a frying pan or griddle with a tablespoon of oil. Over a medium heat shallow fry both sides of the patties - about five minutes on each side until the mixture crisps up. I served with my garlic and rosemary rolls (made into four larger rolls) and Tesco finest chunky oven chips.